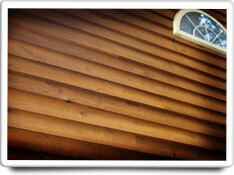 Unprotected wood siding risks being destroyed by insects, mold, and mildew. And rotten wood can allow water damage to occur inside your home. NOTE: The tasks and timings shown here for your Wood Siding are based on a single-family home (owned), located in Massachusetts, United States, with priority set at ‘1 star' or higher, for all possible goals. If you set your personalization differently in your Home Wizard app, then you may get reminders for different tasks and timings in your recommended home care program for your Wood Siding. Prune trees, shrubs, and bushes so that branches do not rub against the wood siding. Check all surfaces for weathering and paint failure. Re-paint or add a stain or water-repellant as necessary. Re-nail loose siding (use rust-resistant screws); replace rotted areas; repair splits as necessary. Check for termites, carpenter ants, and wasp's nest. Pressure wash and clean siding as necessary, or re-paint. Take special care to ensure that ground, debris, leaf piles, etc are not touching your wood siding. This can lead to insect infestation. The benefits of this task are relatively high, in that proper maintenance of your wood siding helps prevent costly damage from pest infestation, water damage, more expensive repairs, etc. The cost of this task can be significant from an investment of time, depending on the size and condition of your home.